A pair of shootings on Tuesday afternoon and evening left two men with serious injuries and triggered a major police response on two ends of Dorchester Avenue. In the first incident, 30-year-old Keldon Liverpool was shot in the head next to the CVS store lot at the intersection of Dorchester Avenue and Richmond St. just before 5 p.m. He was then rushed to Boston Medical Center, where he was listed in critical condition with life-threatening injuries, police said. The homicide unit was called to the scene to investigate as police canvassed the darkened parking lot looking for evidence. Liverpool was walking home from work in what police are calling a random act of violence, Fox 25 News reports. He was neither robbed nor accosted and previous reports indicating a gang connection to the shooting are incorrect. Keldon was shot as he walked down the sidewalk, and multiple shots were fired. 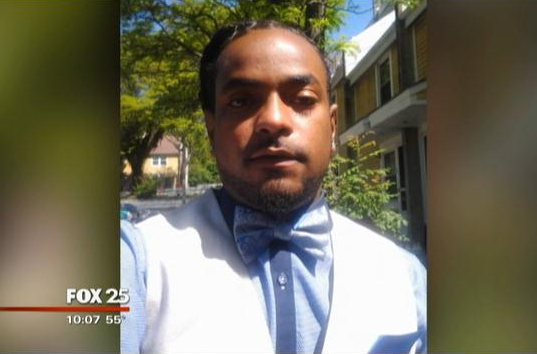 At least one of them struck Keldon in the head, Boston Police Homicide Sergeant Detective Mike Devane told Fox 25. "We believe he was just a random thing. At this stage of the investigation, we don't believe anyone was targeting him in any way. Or that there was any kind of confrontation with him," Devane told Fox 25. Boston Police said there were no suspects as of Wednesday morning. Liverpool's wife Ezra Liverpool is pleading for answers surrounding the shooting. "I know my husband is not into anything with anyone. I spoke to him right before this happened. He told me he was walking home on his way from work," she told Fox 25. Liverpool is a father of three and currently "fighting for his life" at Boston Medical Center as of Wednesday evening. "We could use some help from anyone who may have witnessed the incident or has any information about it," said Capt. Richard Sexton. Eyewitnesses said up to four gunshots were fired. The assault took place directly across the street from the entrance to Lower Mills Library, which at that hour was a busy polling location for two ward 17 precincts in the state election. A description of the suspect was quickly broadcast and a manhunt — which included the use of a State Police helicopter— ensued on the side streets of Columbia-Savin Hill. Later that night, Boston Police announced that they arrested Jarris Charley, 21. He was charged with armed robbery, assault with intent to murder and unlawful possession of a firearm at his arraignment in Dorchester Municipal Court on Wednesday, according to the Suffolk County district attorney’s office. He was ordered to be held pending $100,000 cash bail. Boston Police spokesman Sgt. Mike McCarthy said that Charley was arrested at the C-11 police station after an interview with detectives. He was stopped by police outside of a multi-family home at 47 Savin Hill Avenue. The property “was later frozen pending a search warrant,” according to McCarthy. According to prosecutors, Charley was "identified as the shooter based on witness descriptions, surveillance images, and other evidence, prosecutors said, and his height, weight, clothing, and complexion are all consistent with that of the assailant who was captured on video." Stuart Schrier, an attorney whose office is located directly across the avenue, said that Ly and his wife have owned and operated the family-owned convenience store since 1998. Schier was in the store on Wednesday morning to assist Mrs. Ly, who was working behind the counter where her husband had been shot before. Schrier said that the teenage children of Mr. Ly are often working at the store, which serves a diverse clientele. “Everyone goes in there— you name it. It’s not just a Vietnamese store,” said Schrier. Mrs. Ly, he said, expected that her husband would be released from the hospital in a few days. Back in Lower Mills, the library polling location remained open while police combed for clues in the CVS lot across the street. Voters were instructed to access the library through an alleyway behind ester restaurant on Dorchester Avenue. A steady stream of voters continued to make their way into the library branch using that route, with volunteers and poll workers directing them. “We see no evidence that this would slow turnout in any way,” said State Rep. Dan Cullinane, who went to the polling location shortly after learning of the shooting. He, State Senator Linda Dorcena Forry, and Boston Police Captain Richard Sexton were on-hand to assist at the polling location following the shooting, and were in touch with the police commissioner and the city’s elections department. A number of volunteers from Dorcena Forry’s campaign were staged along Dorchester Avenue and Washington Street to direct voters around the crime scene and into the polling location. A previous report erroneously indicated the shooting was gang-related. Richmond Street was shut down between Dorchester Avenue and Washington Street, with traffic congestion throughout the neighborhood. The scene was repeated two hours later in Savin Hill as police shut down the 1000 block of Savin Hill in the aftermath of the D&D store shooting.